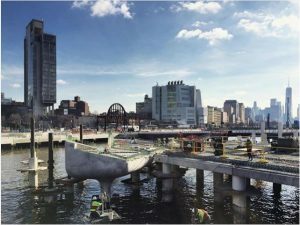 Group PMX, on behalf of Skanska / Hudson River Partnership Trust, provided project management services to meet the limited three-month Pier 55 access schedule for Barry Diller’s $250M Pier 55 Park. 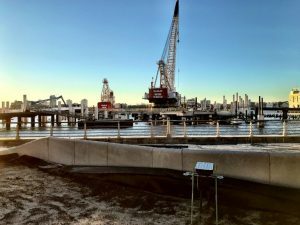 Group PMX’s team served as an extension of staff to Skanska for site construction of components of the Segment 5 Bloomington to West 14th Street (Pier 55) site utility infrastructure project occurring at the new park esplanade within the Pier 54 connection project. The park was designed by Thomas Heatherwick who designed an undulating 2.4-acre platform that rises out of the river like a green Neverland, supported around the perimeter by clusters of Champagne-glass-shaped pots sprouting from pilings sunk into the riverbed. Inspired by the diversity of Acadia National Park, Pier 55 will feature four different landscape typologies on each of its four corners. An amphitheater-like area will offer space for live performances and public art, as well as community events. This nine-acre adaptive project reuses derelict waterfront piers on the Hudson River rebuilt for public use, including a skate park and a merry-go-round. Green parkland is planned for the demolished piers and the pavement areas. Demolition and rebuilding of the piers were performed in an ecologically attentive way as not to disturb the striped bass fish population that uses the river as its main breeding ground. The pier is unique in that it has a gradual incline to its elevation making the water end approximately seven feet higher than on land. The park will also serve as a performing arts center, with a 700-seat amphitheater for music, dance and theater productions.